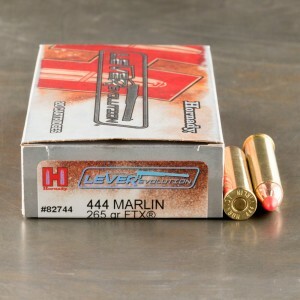 To fully understand 444 Marlin ammo, a short history lesson may be in order. Marlin and Remington introduced the .444 Marlin in 1964. Why? Apparently the .45-70 whose niche the .444 Marlin was to "fill" was unavailable in a lever-action offering. The cartridge is capable of pushing bullets 250 grains and higher up to 2,400 feet per second and generating over 3,000 foot-pounds of energy at the muzzle. Pretty impressive and lethal on big bad critters! In some circles, the quick handling lever-action round has a reputation as a great moose and elk cartridge which it certainly is provided the ranges stay tolerable. Since the introduction of the .44 Marlin, however, Marlin has introduced the .450 Marlin and even its 1972 introduction of a .45-70 lever-action gun. Now there are several big-bore lever-actions available. And Marlin lever-actions have the added design advantage of being side ejection models which enables normal top-mounting of scopes. A good scoped lever-action is deadly in the thick woods! It is a hard hitter on Any North American animal. I have never heard a complaint from man nor bears.